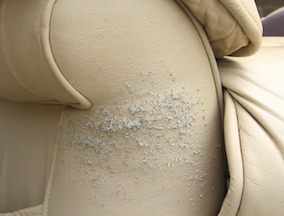 There are two different types of cat damage that you can get on your leather furniture. 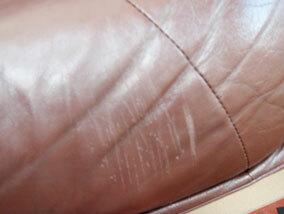 The first is where the cat scratches the sides of the sofa, by plucking out the fibres/hairs from the leather. The second is where the cat will scratch the seating cushion causing a more straight line scratch. From the photos below, select what type of cat damage you have, and then follow the correct guide on how to repair the scratches. 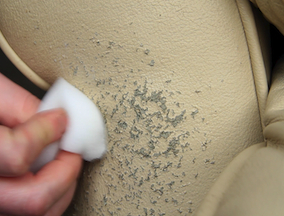 NOTE: These guides show the best way to repair leather, to get a close to perfect repair. However, if you just want a quick fix solution to repairing cat scratches, then you should use the leather re-coloring balm. The balm will put the color back into the scratches blending them in with the rest of the sofa, but it won't repair the roughness, it will just disguise them. The advantages of using only the balm are; it is very easy to do, quick, cheap and will greatly improve the look of the sofa. The disadvantages are, the scratches must be a lighter shade than the rest of the sofa for it to work. This photo shows cat scratches on the seating cushion. You can see that the scratches are only very light and have not damaged the leather itself, only lightly scratching the coating away. For damage like this, the Leather Recoloring Balm should be sufficient to restore the color that has been scratched away and blend the scratches in with the surrounding leather. If the damage looks like the photo to the left; read the instructions below on how to fix it. This type of cat damage is caused by the cat sticking it's claws into the leather, when the cat pulls it's claws out, it draws out the fibres of the leather. 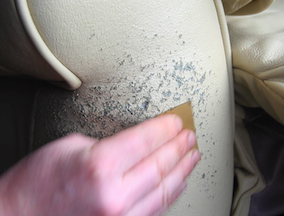 This causes significant damage and the leather becomes rough and unsightly. As can be seen in the image to the left, this leather armchair has suffered significant damage from cat scratches to the left arm. Before attempting to repair cat scratches on leather, it is important to thoroughly clean the leather with Leather Ultra Clean to remove any dirt and grime. As this area of damage is larger than the area covered by a tennis ball, we will be using the Leather Colorant Kit rather than the Leather Repair Touch Up Kit, but the same process can be used for both. 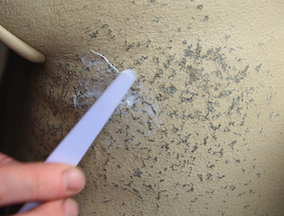 If you are using the Leather Repair Touch Up Kit, simply use a sponge in place of the Airbrush used in the later stages of the guide. After cleaning the area, take a pair of sharp scissors and trim any loose fibres, often found with damage from cat scratches. Please note that only the longer fibres need to be removed at this stage. Any shorter fibres that remain will not affect the quality of the repair or the look and feel of the end result. 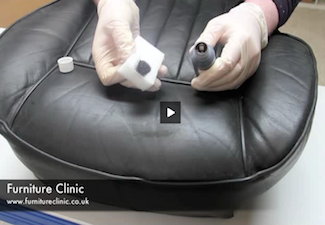 Take care at this stage not to puncture, cut or cause further damage to the leather. When you have trimmed the longer loose fibres, the next step is to apply the Leather Binder. 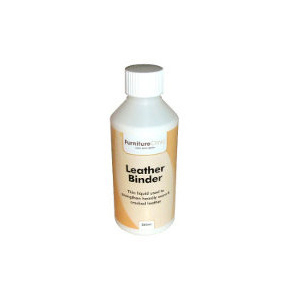 To apply the Leather Binder, simply apply a small amount to a sponge and use this to rub directly into the area of damage. Coat the the entire area and allow to dry. In order to ensure a strong, durable repair, apply 8-10 coats of leather Binder, allowing sufficient time for the previous coat to dry before applying the next. Once the binder has been applied, the area should be sanded down in order to create a smooth, even surface on which to perform the remaining steps of the repair. To do this, simply take a piece of fine sandpaper (1200 grit is sufficient for this job) and lightly sand the entire area that the Leather Binder was applied to. 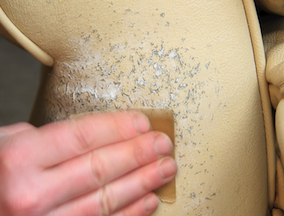 Before approaching this step, ensure that the area is free from any residue from sanding. Then, using the heavy filler and palette knife, spread a thin layer of filler over the scratches. Leave for 20-25 minutes to dry and apply additional layers if required, you should aim to have the holes, scratches and gouges filled so that they are level with the surface of the leather. After applying the filler, it should be sanded down, again, 1200 grit sandpaper is sufficient for this job. .
After sanding, wipe the leather down with the alcohol cleaner to remove and dirt and residue from the leathers surface.This ensures proper adhesion of color when we come to apply it in later stages. Once the alcohol cleaner has had time to dry, it is time for the colorant to be applied. Start off by applying the first coat of color by sponge. Simply pour a small amount onto a sponge and use this to apply a thin coat to the leather. 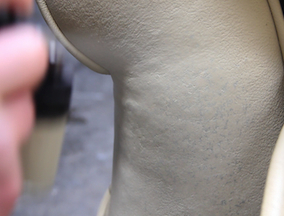 Sometimes after applying the colorant, it emphasises some of the scratches you though were 'healed'. Simply apply more filler, sand down and re-apply the colorant as before. After the first coat of colorant has been applied, if using the colorant kit; you should use the airbrush to begin building up the colorant in a series of thin layers, leaving time for the previous coat to dry before applying the next. 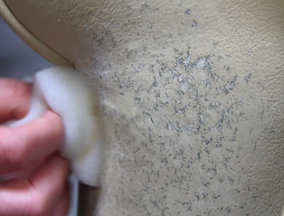 If using the Touch Up Repair Kit, successive layers should be applied using the sponge. Once you have a good coverage of color, either by sponge or airbrush, the next step is to apply the lacquer onto the leather to seal the color in. Take the glossy Super Seal and apply using a sponge or airbrush, in 3-4 layers. This forms the basis for a flexible and very robust finish. After this is done, apply the Leather Finish, using the contents provided in 4-5 layers. For both products, allow time for each coat to completely dry before applying the next. By following these steps and using the products in this guide, you can achieve professional results when repairing cat scratches on all items of leather, with relatively little time, effort or cost. Need advice. Saw video looked good but unsure what I may need. I have a light brown recliner, tan, with scratches on both arms and back. I also have a back large chair as part of a sofa set, sofa ok chair not so much. What would I need to repair these to chairs? Thank you for your inquiry. We would be more than happy to help you with your restoration needs but require some more information from you to advise you correctly. Would it be possible to send us a couple of photos of your leather to our email address, help@furnitureclinic.com so we can ascertain the damage and so we may provide you with the proper products and color choices to restore your furniture? I have an old single recliner and a side chair that my two cats have attacked just below the arm rests. I didn't know if they were worth repairing but we find them incredibly comfortable. Need some guidance. Thank you for your inquiry. We would be happy to assist you with your leather restoration if you could email us a few photos of the leather you are planning to restore to help@furnitureclinic.com, so we can ascertain and recommended the proper products for your leather restoration needs. I have a burgandy sofa with lots of cat damage, mostly on the arms. 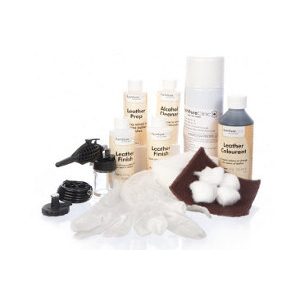 Is there a kit that contains everything, the leather binder, touch up kit, etc. to complete the whole job? Thank you for your inquiry. We would be happy to assist you with your leather restoration needs but require some additional information so we may advise you properly. If you could email us a few photos of the leather you are planning to restore to help@furnitureclinic.com, we will ascertain and respond with an email of the recommended repair products as well as recoloring after repairs are made for your leather restoration needs. Thank you for your inquiry. We would be more than happy to help you with your restoration needs but require some more information from you to advise you correctly. Would it be possible to send us a couple of photos of your auto interior to our email address, help@furnitureclinic.com so we can ascertain the damage and so we may provide you with the proper products? This is something I want to do as part of a start up here in my city. I'm learning very quickly that this for real.. I want to send you guys some pictures of a level 4 difficulty repair on a mustang gt driverside car seat, the bolster on the left is destroyed. I think it can be repaired and I want to attempt it, also restore the other with heavy crack. Thank you for your inquiry. We would be more than happy to help you with your restoration needs but require some more information from you to advise you correctly. Would it be possible to send us a couple of photos of your mustangs interior to our email address, help@furnitureclinic.com so we can ascertain the damage and so we may provide you with the proper products? My daughter's cats came to visit and found my Danish blue leather couch irresistible, for both plucking and for sliding on. I sent some photos to the email account -- please let me know the best products to use for repairs. Thank you for your email. We have received your photos via email and responded accordingly with our recommendations. Please contact at help@furnitureclinic.com for further information you require. Thank you for your inquiry. We would be more than happy to help you with our color choices for your restoration needs but require some more information from you to advise you correctly. Would it be possible to send us a couple of photos of what you are trying to restore to our email address, help@furnitureclinic.com so we can ascertain and so we may provide you with the proper products and color choices for you? You may also contact us at 866-931-8095 Monday through Friday from 9:00am through 5:30pm EST where we will help you navigate our website for our color charts. I don’t think my couch is real leather, it’s just made to look like leather. Will these products still work? Thank you for your inquiry. We would be more than happy to help you with your restoration needs but require some more information from you to advise you correctly. Would it be possible to send us a couple of photos of your couch to our email address, help@furnitureclinic.com so we can ascertain the damage and so we may provide you with the proper products and color choices to restore your furniture? Hi. I have cat damage to my Pottery Barn whiskey colored sofa (med.-dark brown with a bit of maroon). My question is, should I buy the dk dk brown color and lighten/adjust the color with the Touch Up kit but with the colorant kit buy a shade lighter (dk brown) to replicate the whiskey color? Also, do you charge extra for custom color matching? Can one email a picture or send a sample to you? Finally, I signed up yesterday for your email offer to get 20% off but the email I got from your company makes no mention of the coupon offer for new customers. Thank you for your inquiry. We would be more than happy to help you with your restoration needs but require some more information from you to advise you correctly. Would it be possible to send us a couple of photos to our email address, help@furnitureclinic.com so we can ascertain the damage and so we may provide you with the proper products and color choices to restore your leather furniture? We also will provide you with the 20% off discount code for signing up for emails. Hello my couches have scratches on the side and was hoping this product could help me, but so not really know where to start. can you help? Thank you for your inquiry. We would be more than happy to help you with your restoration needs but require some more information from you to advise you correctly. Would it be possible to send us a couple of photos to our email address, help@furnitureclinic.com so we can ascertain the damage and so we may provide you with the proper products to restore your leather furniture? I need to repair our burgundy sofa where can I get the correct colorant kit? My cat likes to scratch on my couches and it isn’t horrible but it noticeable. They are small scratches but I need to cover them up as I am living in an apartment. I just need to cover it up with some color. What is my best option. Also is there a way I can send you a picture of the color of my couch to get the right color? We would be more than happy to help you with your restoration needs but require some more information from you to advise you correctly. Would it be possible to send us photos to our email address, help@furnitureclinic.com so we can ascertain the damage and so we may provide you with the proper products to restore your leather basketballs. I have a few leather basketballs that my son took outside one day. These balls were made to be only used indoors so now they are ruined. I'm hoping to bring them back to life. Any thoughts. Super Seal is our High Gloss Finish which seals in the Colorant and should be applied before your Final Finish. Our Heavy Filler is a leather compound that adheres to leather to make repairs and fill in cracked leather. We would be more than happy to help you with your leather restoration needs if you would be able to provide us with a couple of photos to help@furnitureclinic.com we will ascertain the damage and provide you with the proper products to restore your leather. Can it be used on vinyl luggage? A cat scratched my Harley Davidson bags. We would be more than happy to help you also with your restoration needs but we require some more information from you to advise you correctly. Please send us photos to our email address, help@furnitureclinic.com so we can ascertain the damage and so we may provide you with the proper products to restore your luggage. How do I know what finish I need? You can determine the finish by the amount of shine your leather has. We offer five different leather finishes from Gloss (shiniest), Matte (dullest), Satin (50/50 mix of gloss and matte), Semi-Gloss (75% gloss, 25% matte) and Semi-Matte (75% matte, 25%gloss). Also you can always contact the manufacturer of your furniture to decide which finish you may have or you can use or color matching service where we not only match the exact color of your leather but also the finish for an additional fee of $14.95. All we would need is for you to send us a leather sample at least the size of a nickel. 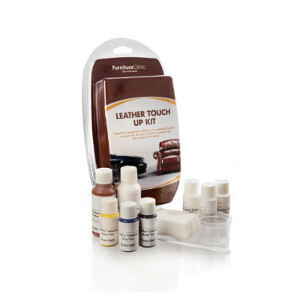 If you have any further questions or concerns on which products you may need for your leather restoration please feel free to email us at help@furnitureclinic.com so we may be able to assist you further. 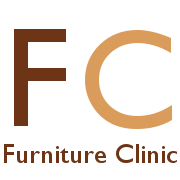 You can purchase any of our products from our website www.furnitureclinic.com or please feel free to contact us so we may assist you with placing an order. Id also like help with the faux leather issue. My dogs claws have broken the surface i know it will start perling like crazy in no time if i dont stop it now. Where can i send pictures to get help? Thx! We would be more than happy to help you also with your restoration needs but we require some more information from you to advise you correctly. Please send us photos to our email address, help@furnitureclinic.com so we can ascertain the damage, and so we may provide you with the proper products to restore your furniture. Hello! Can I use these same products on faux leather? We would be more than happy to help you with your restoration needs but require some more information from you to advise you correctly. Would it be possible to send us photos to our email address, help@furnitureclinic.com so we can ascertain the damage, and so we may provide you with the proper products to restore your furniture.